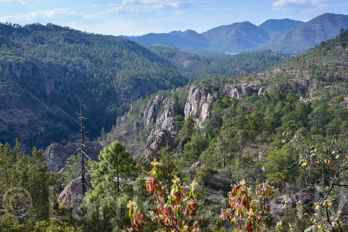 Located in the Sierra Madre Mountains of northwest Mexico lies Barrancas del Cobre aka Copper Canyon. The name is a bit of a misnomer it that the area is actually made up of 11 major canyons and seven rivers, not one, that drain the western side of the Sierra Madres. The name comes from the green color of the rock in the area. The area is larger and deeper than the Grand Canyon in United States. The canyons were formed millions of years ago by volcanic eruptions that were heavy with ash. The ash eroded away forming deep canyons and high mesas. The landscape makes travel difficult. The narrow dirt roads wind up over around and down the mountains in seemingly never ending switchbacks. The area is also rich with minerals, ranchos, and wonderful friendly people. 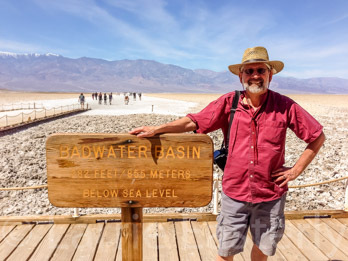 Last October a friend and leader of the 2017 Death Valley trip posted on the Expedition Portal Forum that he was going to make a final trip to Barrancas del Cobre. He has been there numerous times over the past 30 years and this was to be his farewell visit. I got a strong nudge from Spirit to go so naturally I signed up. The group coalesced into eight vehicles carrying eleven people. I knew about half of them from the Death Valley trip. We all met in Douglas, AZ on April 20th for dinner at the Gadsden Hotel. The hotel was built in 1907 burned to the ground in 1929 and rebuilt with an Italian marble staircase and columns in the lobby. It is beautiful on the inside with stained glass lobby skylights and a Tiffany and Company stained glass mural on the second floor. At dinner we discussed the last minute details of the trip including crossing the border, exchanging money and other housekeeping items. Bright and early the next morning we left our hotel and headed for the border. There several of us were pulled over for a vehicle inspection. The officer took one look in the van and brought in a German Sheppard to sniff out any contraband. It was fascinating to watch the dog work. It hopped right in the van and sniffed all the cabinets, bed, seats, and fridge. It was very methodical. Once it was done its handler got it out of the van and I was told to go on to the next stage of the entry process. Three right turns brought me to a parking area and the immigration building. The first step was to get my entrance permit by showing my passport and paying a fee. Next was to get the temporary vehicle import permit. This took the most time for me. The van and it was over 6,000 pounds so they had to verify it was not a bus. I went outside to get a customs officer to look at the van to verify that it was not a bus. Once this as done it was back inside to complete the paperwork, pay the vehicle import fee, and get the window sticker. Once we all got our stickers we left Agua Prieta and headed south on Mexico Route 2. 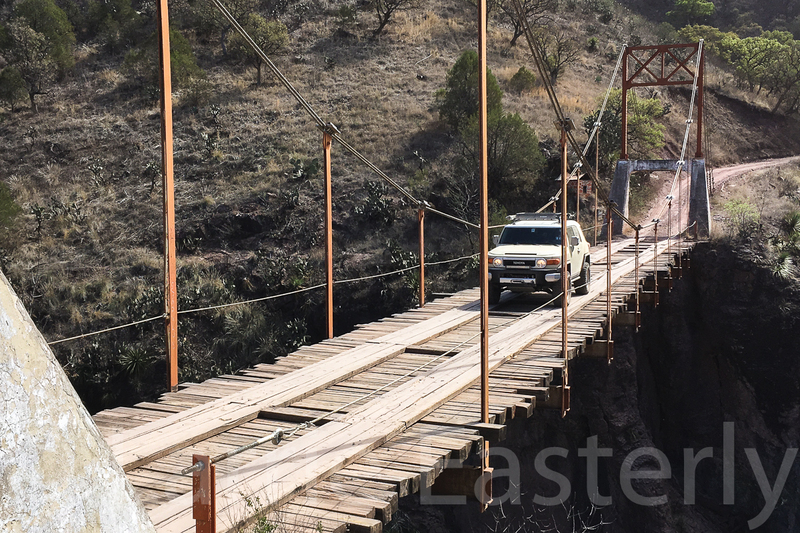 Most paved roads in Mexico are narrow, do not have shoulders or breakdown lanes, and there is a six or more inch drop to the dirt or rock at the edge of the pavement. It took a while to get use to driving on these roads. You must to pay close attention to your wheel placement, otherwise you are in the ditch or on the oncoming lane of traffic. Where sections of the roads need to be rebuilt the contractor just close that section digs it up and rebuilds it. To keep traffic moving dirt road bypasses are built around the construction zone. The dirt bypass roads are several miles of bumps, dirt and dust. Top speed is 10 mph or less. Our first stop was the pre Colombian ruins at Paquimé (Big Houses) near Nuevo Casa Grandes. Paquimé were occupied from about 1130 C.E. to 1450 C.E when it were abandoned. The ruins are partially restored and cover a large area. 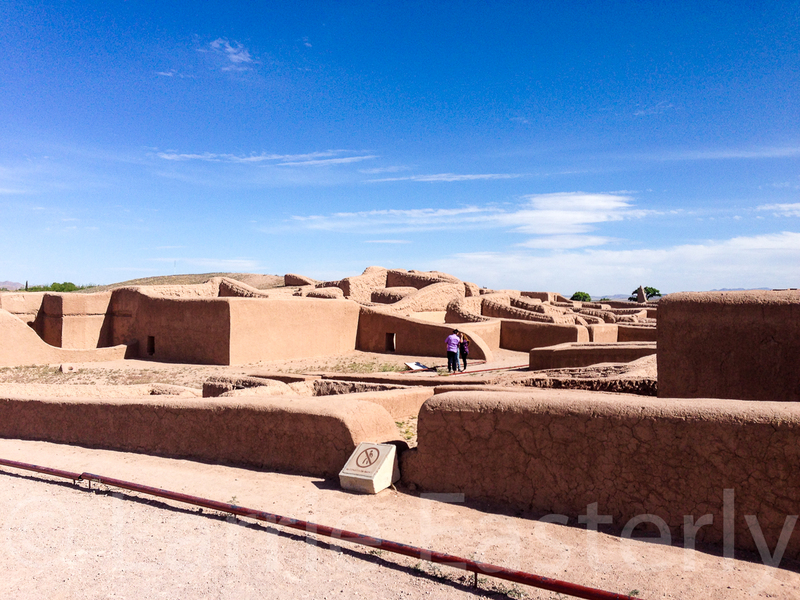 The walkways winding throughout the ruins give a view into each of the main buildings. There is also a very good modern museum that displays artifacts, pottery and other items found on the site as well as telling the story of the people that lived there. One of the most surprising things in the museum is the vast quantity of large and small sea shells that were found on the site. 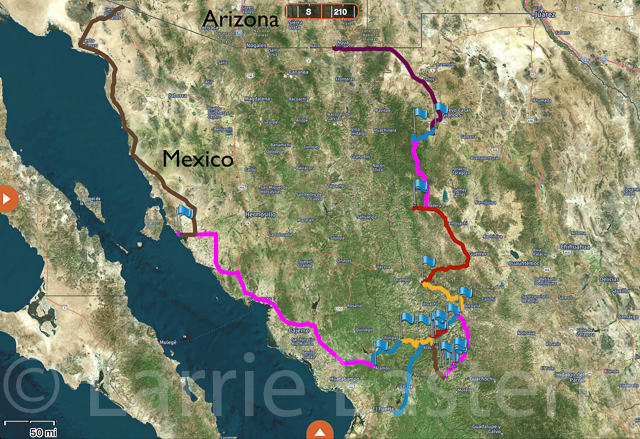 Paquimé is about 244 miles, as the crow flys, from the Sea of Cortez. It amazes that people would make the journey through the Sierra Madre Mountains and Sonoran desert to the Sea to get shells for decoration or trade. In the 1960s a poor farmer, Juan Quezada, was collecting firewood near Paquimé when he found some pot shards in both the Paquimé and Mimbres styles. He also found clay deposits and started experimenting to see if he could recreate the pottery. He was successful and started to make and sell pottery. Soon he was teaching his family members and others in the town of Mata Ortiz. They learned the craft well. Today Mata Ortiz Pottery and can be found in the some of the best art galleries around the world. Most of the people, including the children, in the village are involved in making the pottery. We spent our first night in Mexico at the Adobe Hotel in Mata Ortiz. 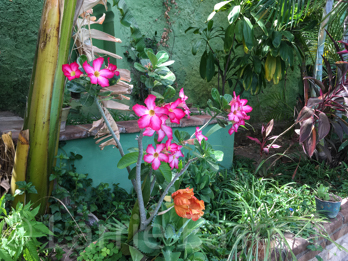 The hotel has a large common area comfortable rooms and is surrounded by flowers, shrubs and trees. Word got out that we were in town. Soon residents were coming by the hotel showing us the pottery they had for sale. The next day as we walked around the village people would invite us into their homes to show us their pottery. After lunch we were invited to a potters home to see how the pots were made. As I understand it the pots are not put in a kiln as we know it. They are set on the ground, a wire framework is placed over them and the fire is put on top and around the framework. Another interesting point is that they use a lock of children’s hair to make the brushes used to apply the glaze. They use children’s hair because it is thicker than adult hair. 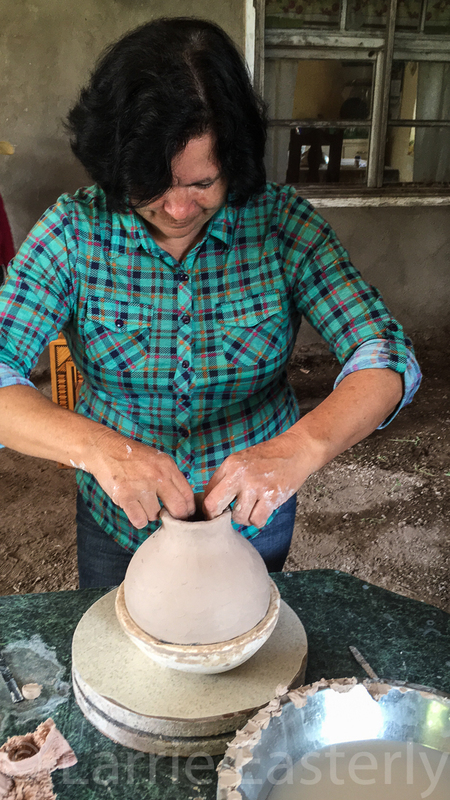 We carefully packed our pottery away the next morning before heading for Hacienda Del San Diego and the rest of our trip. Our tour guide at the hacienda was the granddaughter of the owner. He had fought a long court battle to prove that he was born and lived on the property all his life and should own the property. Several months before we arrived he had won the title to the land. One of the reasons for the Mexican revolution was land reform. After the revolution the peasants were allowed to own the land as long as they lived and worked on it. Once they left the land reverted to the original owners. It was not a good deal for the peons. 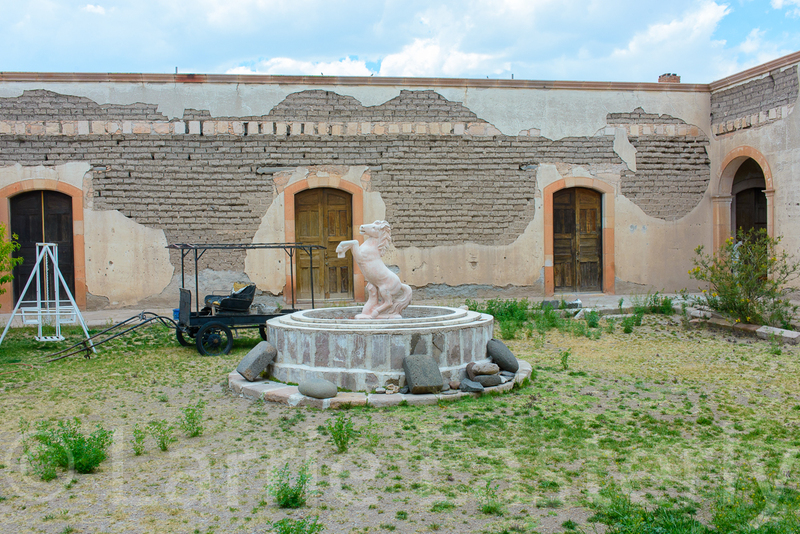 The family that now owns the hacienda is slowly restoring it. She took us on a tour and pointed out the masons marks on the stones, bullet holes from the revolution, and Indian attacks and told us the history of the place. It was interesting to learn that each hacienda had it own currency and company store. This was another way for the owners to control the peons. We thanked her for her time and headed west on a paved road to the Cueva de la Olla (Valley of the Caves). On the way we stopped to help a family that had gotten a flat tire. They did not have a jack, tire iron, or spare. Bruce got one of his jacks and the rest of the tools needed to change the tire. We got the tire off, patched it with George and Marie’s patch kit. We declined their offer to pay us and continued on our way. The caves are on private property and have become a very popular tourist attraction. When we arrived there was a Closed Monday sign on the locked gate. Frenchie, our leader, walked up to the main house to see if the owner was home. He was not. Frenchie knew there was a campground in the next town so off we went. When we got there we stopped at the local store to inquire about the campground. The woman there told us she was in charge of the campground. The bad news was that the owner had left about a half hour before and took the key with him. Not to be out done Frenchie asked if there was a rancho we could stay at for the night. It turned out that her mother owned a local rancho. She sent her husband to get her mother. She agreed to let us stay, showed us where it was and even provided a large quantity of wood for our campfire. All at a very reasonable price. The next morning we headed south for Madera on another paved road. Once there we turned west on to a very rocky dirt road. This was probably the worst road we would be on the entire trip. The prize at the end of it was Waupoco Hot Springs, a fantastic hot springs tucked in a narrow mountain valley next Rio Sirupa. The facility consist of two roughly Olympic size swimming pools filled with naturally hot water. We were the only people there so the caretakers let us camp near the pools. The hot pools were a joy after a long day driving on dirty, dusty mountain roads. The following day we went to two different cliff dwellings. On the way we had to cross an old suspension bridge. We knew it was safe because we saw an overloaded log truck pass over it. 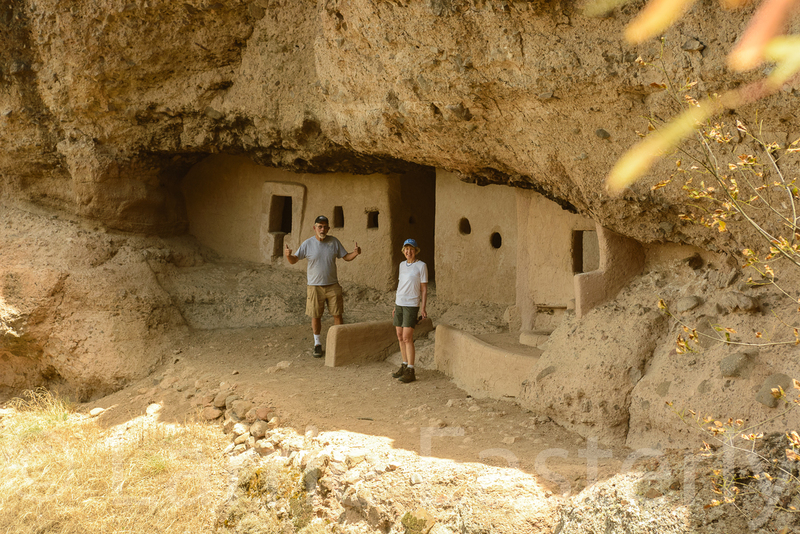 It was an easy hike down to the first cliff dwellings at Cueva Grande (Great Cave). It consists of several partially restored buildings in a large cave. There is a waterfall that passes just to the right of the cave mouth. It had been a low water year so the falls was just dripping when we were there. The falls feeds a stream below the cave and then flows out into the valley below to irrigate the crops. The hike out to the Cave of the Serpent went across a mesa and down through a narrow slot canyon. The reward was a beautiful view of the valley below. Again the dwellings were partially restored. The interesting thing about this dwelling is that you could enter on one side, walk through it to come out on the opposite side of the mountain. After all eleven of us were back at the vehicles we headed back to the hot springs for another relaxing soak in the pools. The hot springs generates so much water that much of it is by passed around the pools and dumped into the river. The three by pass pipes have a constant flow of shower temperature water pouring out of them. They were great to stand under. The next day we traveled back to Madera on the same rough road and then on to Basaseachic Falls. At 807 feet it is the second highest waterfall in Mexico. The view across the valley from the overlook was not impressive. It was a low water year so there was not much water flowing over the lip into the valley below. The view into the valleys below the falls and the surrounding mountains was worth the time to get there. When we got back to the parking lot Kurt noticed that the van was dripping coolant. We all looked under the hood and decided it was It was not coming from the overflow like we thought. Rather than figure out the issue in the parking lot we drove the six miles back to camp. There we discover that the the radiator fan blades cut into the upper radiator hose. The owner of the campground offered to take me to the local auto parts store. There we found a hose that might work. We got back to camp and realized that the new hose was just a bit to big and a bit to long. At this point I decided to eat dinner enjoy the evening campfire and figure it out in the morning. The solution came to me in my morning contemplation, use silicone rescue tape to fashioned a plug for the gouge the fan made and then wrapped the area with rescue tape. I discussed the concept with the rest of the group and they agreed that it would work. The solution worked so well that the patch held the rest of the way back to Oregon, about 3,500 miles. Once the van was operational again we packed up and headed southeast towards Creel. Sitting atop a 7,800 foot mesa Creel is a tourist town with shops, restaurants, hotels, and camp grounds. 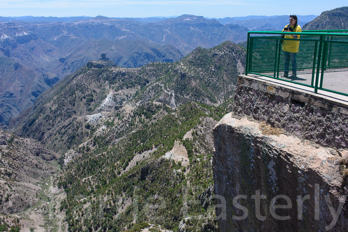 There are several tour operators that take visitors into Barrancas del Cobre. 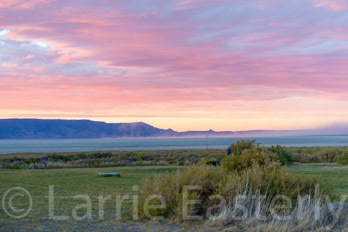 We spent two nights in Creel at the an old KOA campground that has camping facilities, cabins and a restaurant. Some of our group stayed in cabins while Mynor, Kurt and myself camped. After arriving we spent the afternoon wandering around the town. While Bruce and I were taking in the sites a white Ford van pulled up. It had two seats attached to the roof rack. Bruce talked the driver into letting us sit up on top while he drove us around the town. It was great fun. We left our vehicles at the hotel the next day and headed for the train station. No driving today. 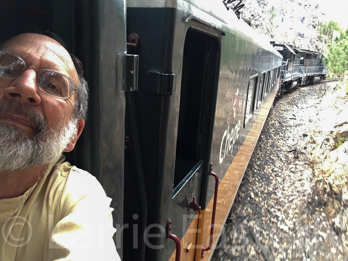 We would take the ChePe train on the 170 mile journey from Creel, elevation of 7,800 feet, to El Furete, elevation 600 feet, where we would spend the night. The train clings to the canyon walls as it makes its way through Barrancas del Cobre. On the way it passes through 11 miles of tunnels and over 2.3 miles of bridges. At one point the train does a complete 360 degree circle as it winds its way up around and into the mountains. In one of the longest tunnels the train does a 180 degree turn before descending to another 180 across a bridge. Along the way we were treated to beautiful scenery and good food. The cheese cake was delicious. 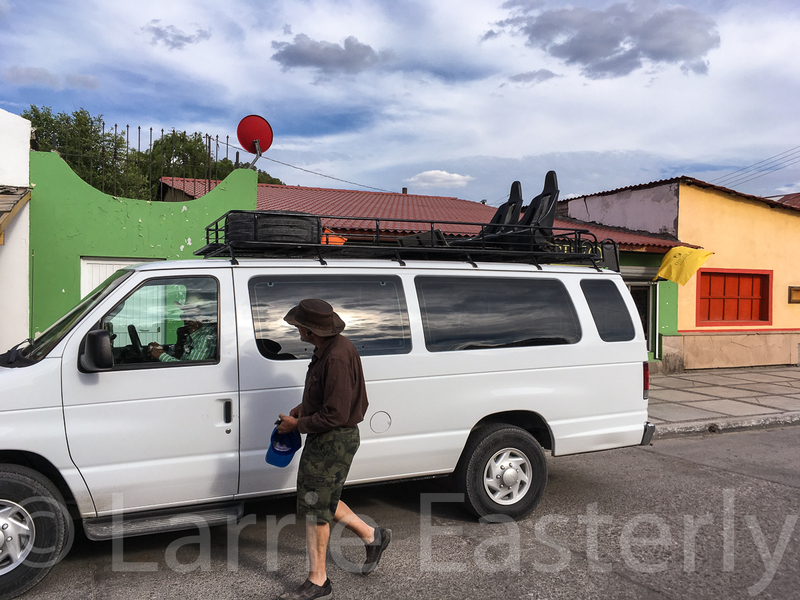 At long last we came out of the mountains and on to the flat as we crossed Presa Miguel Hidalgo reservoir and made our way to El Fuerte. The shuttle from the Posada del Hidalgo Hotel picked the 11 of us up at the train station. The hotel is built in the typical Spanish style with a blank front facing the street and a wonderful garden with tropical trees and flowers on the interior. Legend has it that the hotel building was originally built as a garrison in the 17th and 18th centuries. It then became the home of Don Alejandro del la Vega father of Don Diego del la Vega the legendary Zorro. In the central garden there is a statue of Zorro complete with whip, sword, cape and mask. Dinner that night was at the hotel. Several of our group had river lobster which are very large, six inch body, crawfish. They were delicious. The next morning we were back on the train to Creel. This is probably my only disappointment about the trip. I would have liked to have spent the day wandering around the old colonial section of El Furete. 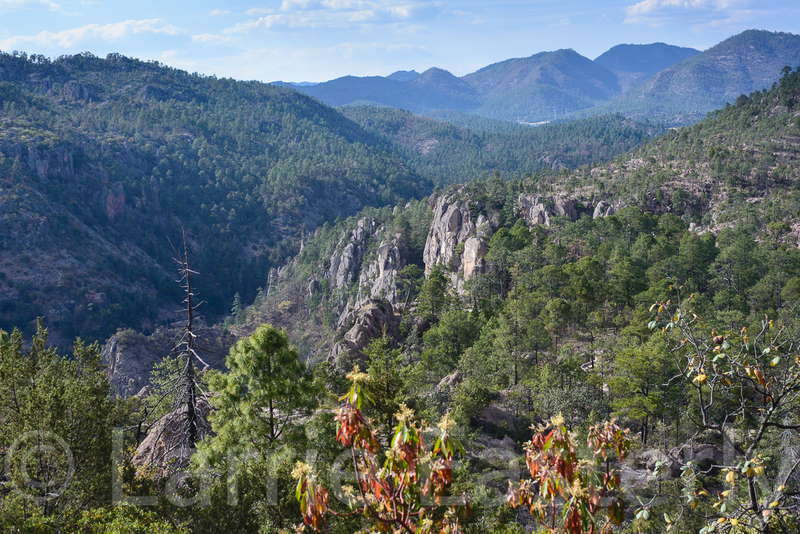 The train ride back to Creel showed us a different view of the canyons that make up the Barrancas del Cobre. One of the nice things about the train ride is that you can stand on the platform between the cars and look out the open windows. The views in either direction were amazing. The following day we were on the road again heading south towards the Satevo Mission. On the way we stopped for lunch and to relax on the Rio Munerachi. The Satevo Mission has had a rough life. The original building was built by the Jesuits missionaries in 1640. The native Tarahumara revolted in 1652 and destroyed the mission. It was rebuilt by the Jesuits in 1674. In 1918 during the Mexican revolution the mission was attacked and burned. Since then the mission has been partially restored and is still used as a church by the community. The town decided to leave part of the burned section of the building un finish and the bullet holes as a memorial to those that died in the revolution. As we were getting ready to leave one of the locals asked for a ride back into town. I was the only one with a vacant passenger seat so he rode with me. It took a while to get to camp that night. As we came around a downhill hairpin corner we came face to face with a dead pickup truck that was loaded with cattle and pulling a loaded cattle trailer. We tried to help them get the truck restarted. It fuel in the tank, spark, and air but would not start. The owners thought it was the fuel pump that failed as no fuel was getting to the engine. Charles towed the truck up the hill with his Jeep and out of the traffic path. While we were working to move the truck a ranch hand rode up on a donkey and then went to get the ranch owner. While he was gone another couple of ranch hands came up driving a small heard of cows. All the bystanders got out of the way of the cow horns. While all this was going on Bruce’s Jeep decided to mess up its fan belt causing it to not start. 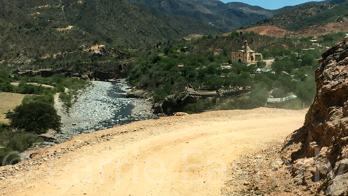 Several hours later the dead truck and trailer were out of the way, the cattle drive was over, Bruce’s Jeep was running again and we were on our way to camp on the banks of the Rio El Fuerte. We pulled on to the beach way after dark, did the necessary things around camp and went to bed. We all slept in the following morning. Once we were up we enjoyed the clear cool water. We just needed to be careful where we stepped as there hundreds of polly wags in the water. We broke camp after lunch and headed to Urique. Then things got a little weird. We encountered three very drunk people in a white car coming towards us. They stopped to let us by. We should have just kept driving past them but Frenchie stopped to talk with them. Then Mynor stopped as well. Things degraded from there. Mynor left them and we continued on. It left a bad feeling in the group so several miles later we and pulled over to discuss the situation. We decided to bypass Urique and instead go directly to the Paraiso del Oso Lodge near Cerocahui. On the way to the hotel Bruce’s Jeep had an aftermarket bracket fail causing another fan belt issue. We all pulled over and waited while Bruce, Charles, Mynor, and Greg removed the offending parts and install a new fan belt. While we waited several large dump trucks carrying ore from the local mine drove by. We never saw the white car with the drunks in it again. One of the suggested driving rules in Mexico is “do not drive at night.” Well we did what we had to do and arrived at the hotel well after dark. Once we got our rooms they cooked us dinner. 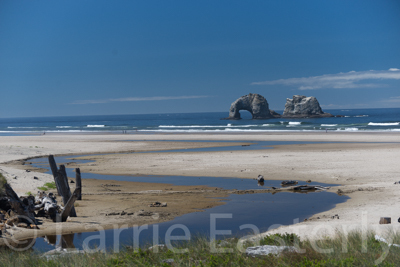 A rough translation of Paraiso del Oso Lodge is Bears Paradise Lodge. The lodge got its name from one of the rock pillars that are behind the lodge. It looks sort of like Yogi Bear in profile. It even has his hat. The following day the owner of the hotel was our guide around the area. 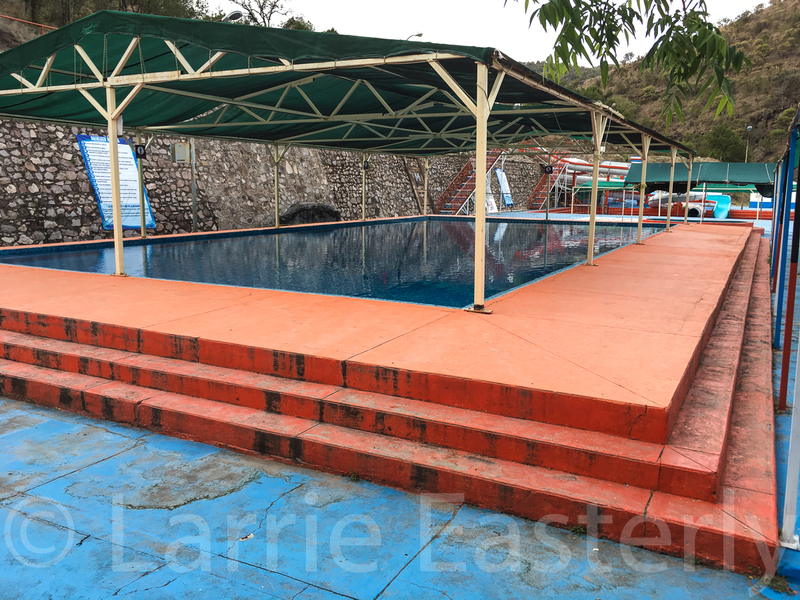 Our first stop was the Parque de Adventura (Adventure Park) at the edge of the Rio Urique Canyon. To get a better view of the river and canyon systems that make up the Copper Canyon area we decided to take the cable car across the canyon. The view from 4,200 feet above the river was spectacular. The rides at the adventure park includes the second longest zip line in the world. It crosses the canyon close to the cable car. It is about 1.8 miles long and takes 1.5 minutes to cross the canyon. I seriously thought about doing it. From the adventure park we took the back way to the lodge through the Rio Septentrión Canyon. This is one of the canyons that the ChePe Train passes through. At times we were adjacent to the tracks. At other points we were well below the tracks in a narrow lush green canyon. The road was sandwiched between the mountain on the right and the river on the left. Back at the lodge they were preparing for a banquet. A group of retired nurses had rented the lodge for a reunion. We were all invited to join in the celebration. Part of dinner was cooked in front of us. The chef invited several people to come up and stir the pot. It was great fun watching the nurses taking turns stirring while dancing to the songs being sung by the rest of the group. Several of our group also joined in the stirring or the pot. 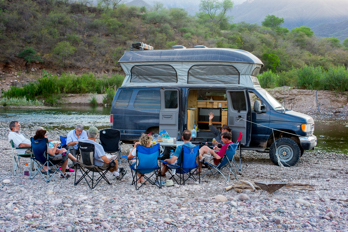 We said our goodbyes to the owner the next morning and crossed the mountains to our next camp on Rio Chinipas. On the way we stopped at Guazapares for lunch and supplies. While there Frenchie started handing out stickers and Marie handed out pencils to the local school kids. The teachers thought it was great fun and got in line for their gifts too. We got to camp early, for a change, and settled in on the banks of the river. The nice thing about the van is that it is large and the top pops up. I try to park it so that the drivers side faces the sun. This provides shade on the passenger side. It was sunny and hot so after everyone got setup we all gathered around the shady side of the van for snacks before dinner. The Dolisa Hotel in Alamos was our next stop. Again some of us got rooms and others of us camped. Street dogs are everywhere in Mexico. We were walking around the town center after dinner when a dog smelled my leftovers. The next thing I knew it was doing tricks and looking at me with it’s sad mournful eyes trying to talk me out of tomorrow’s lunch. I ignored it for as long as I could and then broke down and gave it one of the burritos. It followed us back to the hotel where Frenchie poured out some dog food for it. In the morning Mynor took us to his aunts house. It was typical of many houses in the old part of town. Nothing to look at on the outside but a tropical oasis full of flowering plants, trees, shaded areas and a pool on the inside. It was a real treat to see the inside. 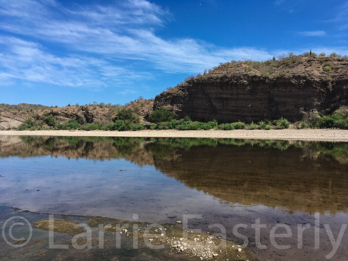 We left Alamos around 11:00 am and headed for Bahia del Kino on the Sea of Cortez (Gulf of California). We had some concern about going there because the winds coming off the sea can be very strong. We arrived late in the afternoon and were pleased to find light winds, sunny sky’s and mild temperatures. Mynor and his family had been to Bahia del Kino many times before. He suggested we stay at the La Playa Hotel. One look was all we needed to convince us to stay there. After we got settled in Mynor took us to his favorite restaurant, El Pargo Rojo (The Red Snapper). The the fresh seafood was outstanding. The following day some of the group headed off to the Suri Indians to look at and buy baskets. 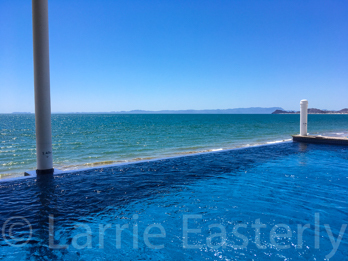 The rest of us sat around the pool, talked, swam, read or enjoyed the sea the rest of the afternoon. That night was our final meal together as the next day were would be heading our separate ways to get home. Mourning cam and all the members of the went their separate ways. It was sad/happy occasion to see our new and old friends off on their next adventures. Kurt and I headed up the coast road towards Lukeville AZ/Sonoyta Sonora. The trip went well although we did have to double back about 20 miles to get our temporary vehicle import tags removed and our money refunded. After that the border crossing into the Arizona was easy. The hardest part was waiting in the line of cars to cross the border. We spent the night at Organ Pipe Cactus National Monument. After breakfast I headed north to Tucson. But that’s another story. 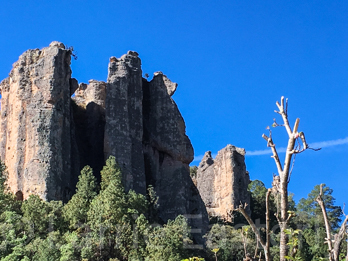 All in all the trip into the Barrancas del Cobre area for Mexico was a great adventure. I met some wonderful people, made new friends, saw a beautiful part of our planet and had a wonderful time.